I love this visual about Introverts. Since I have a son that is a true blue introvert, I have learned to interact with him in all of the above ways. Introverts are such special and gifted people. They usually think long and hard before acting. They can figure just about anything out, given the time and space to do it. When they find someone that is their true friend, they will honor that friendship like no other. They usually don’t like crowds. When they DO speak, they like to be really heard, so pretending to listen doesn’t work with them. THEY DO notice when you’re not really present. They NEED alone time, much more than an extrovert does. They NEED quiet. They really do need to be given lots of transition time from one activity to the next. When they are rushed they are stressed, more so than the rest of us. Introverts DISLIKE labels. Don’t label them. Empower them to be exactly as they are. Honor the introvert in your life by respecting his need for solitude and quiet spaces. Honor him/ her by being ultra respectful of his/her needs. If you do, you will have a confident, loyal and thoughtful person in your life. One who might change the world with his introspective nature. 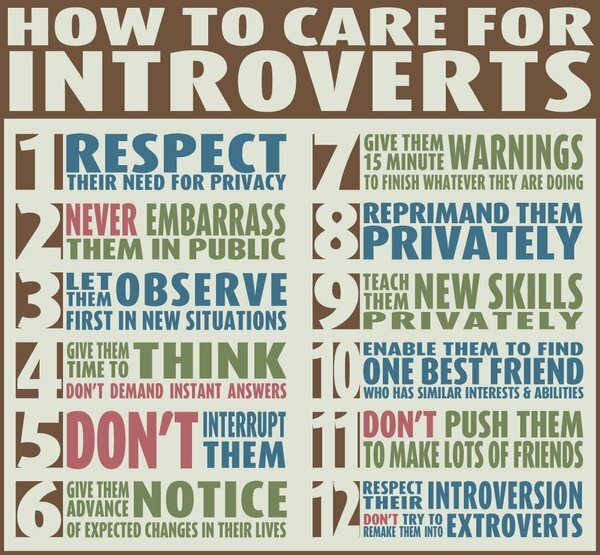 You are currently reading How to Care for Introverts at Michelle Conaway.